For all things food and drink, then look no further. Living in St Albans is just wonderful and I want to gradually give an honest appraisal of my findings. I might be snobby about certain aspects, but that is only because I care so deeply about the quality of things we gobble and digest. Happy eating! Mokoko, as good as Tomoka Spirits or just for show? I heard about Mokoko one afternoon when I was perusing for Christmas presents and came across Tomoka Spirits in St Christopher’s Place. The owners of this really rather wonderful Willy Wonka kind of shop mentioned they owned Mokoko and so I got straight onto Safari and browsed their website. Trendy music started playing and I already felt I was in London at one of my favourite cocktail bars, ‘The Experimental Cocktail Club’ or ’69 Colebrook Row’: Both these places are sacred for me, for what they offer in new flavour experiences is an utter thrill. Please believe me when I say I love my booze. We have over 100 bottles of all sorts of wondrous alcoholic potions in our home and I have long been a fan of Absinths and Gins. I talked for ages with the nice member of staff, Roberto, in Tomoka Spirits. His knowledge was boundless and the way he was so eager to let me try new spirits, and point out methods in which all the wondrous potions were distilled was heartwarming. This really raised my hopes for Mokoko and I felt like this place might just be wonderful. Mokoko makes a bold claim of being the only real ‘style bar’ which I presume means they offer a little slice of ‘East’ London in their venue, but my question was ‘is it the genuine article, with cocktails to match, or a cheap knock off?’. 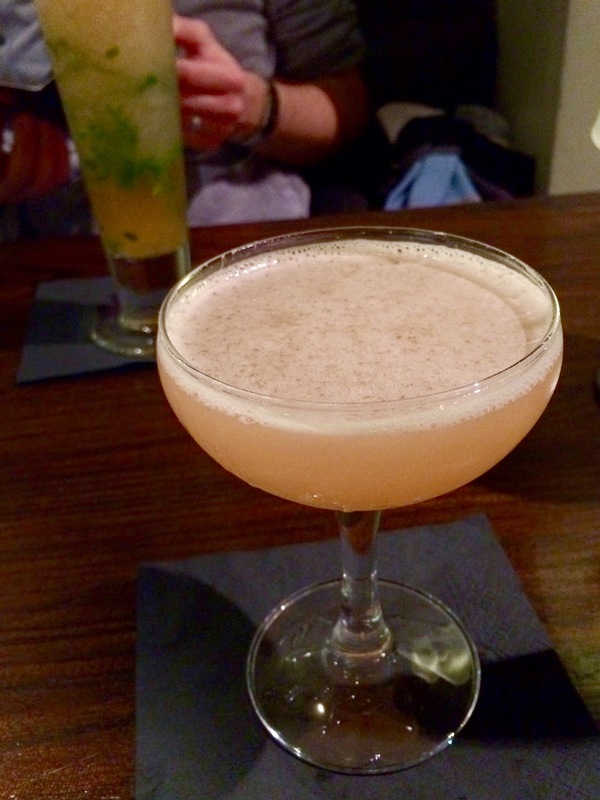 There appear to be very few cocktail bars in St Albans, especially ones that pride themselves on the quality of their product like many of the food venues do, so I had really hoped Mokoko would live up to expectations. Chris and I chose a Wednesday at 9pm to pop along. 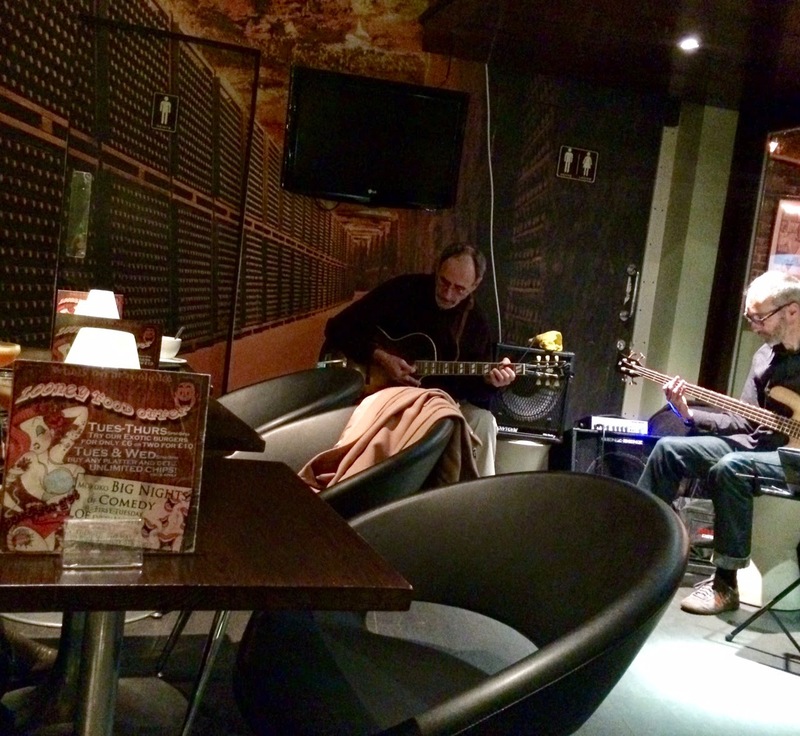 He finished work late and Wednesdays is Jazz night, so I thought it would be a nice place to chill out. Also Tuesday-Thursday you get 2 (unusual) burgers for £10 so we might as well have tried that. We walked in and the place was no where near as full as I thought it might be, and I kind of felt sorry for the really wonderful guitarists playing a mixture of Gypsy ‘style’ Jazz, really rather well. The combination of two guitarists I found incredibly satisfying; my father used to play flamenco guitar and my record producer is a classical guitarist. Again, there was a slightly stale smell when I walked in, similar to that I found in CHI, so I am guessing it must be the old buildings; nevertheless it can be off putting. The venue was nicely lit and we sat down in the window. There was a rather loud and annoying group of slightly drunk middle aged adults spoiling the first few minutes for me, but they left shortly after. It goes to show that sometimes over 21 venues, such as this, are no different from those that use their discretion when letting certain types of groups in, which is how the aforementioned venues in London do their business. Everyone was perfectly friendly. No real cause for concern and it was adequately laid back for a place like this, although I might add that it would have been nice, seeing as we were first timers, to be engaged in conversation by the waiter. We were talked at a little at the end of the meal which meant we left with a skip in our steps, but even in the mega busy cocktail and restaurant venues in London, it is always nice to be asked ‘is it your first time here?’ and ‘how long have you lived in…?’. This provokes further conversation and gets things off on the right foot. In my experience all these little things do matter because they are what set certain places apart, and in my experiences, if my first time is warm and friendly even if the food or drink are not fab, then I will still go back wantingly. The burger menu was, to say the least, unusual! But to be fair, they do say as much. Things like Kangaroo and Crocodile burgers, which actually I found a little annoying. I wanted a well made Beef burger, or at least Lamb. Something that will be tender and make the mouth water a little. Crocodile is incredibly dry and the flavour, whilst not bad, is it worth it? They cannot sell enough of them every day to have the fresh article on hand which means it will either be frozen and defrosted or sat in the fridge for a very long time. If I am wrong please feel free to shout me down. They did have a Wagyu beef version, which so happens to be the best beef on the planet, but they did not have any to serve me. Maybe the fact they had sold out should hint as to where their priorities should lie. We both opted for the Venison burgers. These were nice enough and for the price a real bargain I thought. Chips were your typical fat oven chips, at least seasoned well and had some nice cracked black pepper sprinkled over (always much nicer than ground). 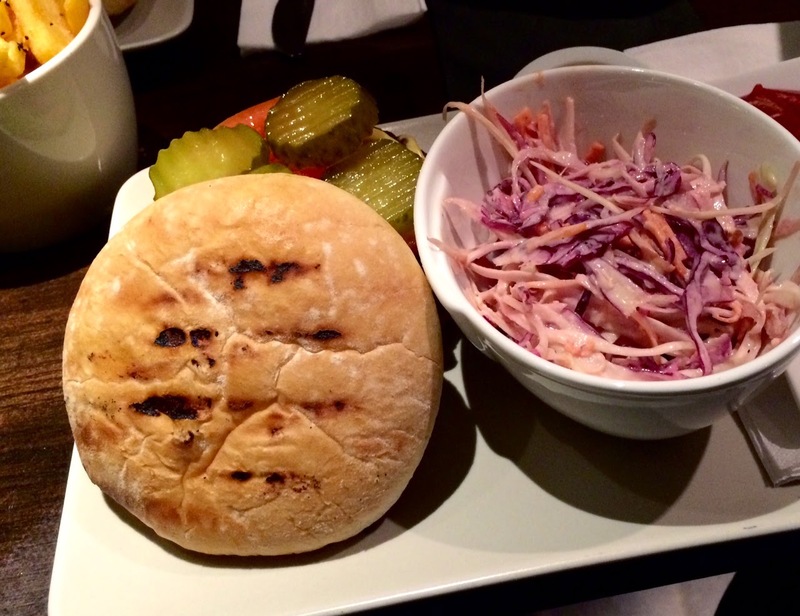 The bun was nicely charred to give a smoky flavour, and the coleslaw was nice and generous in the proportion. It was weirdly dressed with salad cream which was OK, but I do prefer a little more inventive a dressing. Perhaps apple vinegar and a homemade mayo, but granted, this is not the kind of place where one comes just for food. The burger was filled generously with salad and cheese and a nice touch was the different sauces on the side; my favourite being a curry one. The only real let down was the meat itself; the star had been charred, just a little too much. It was very tough, and venison, off all things should be melt in the mouth. If it is overdone you loose all the nice game flavours. All in all, adequate, and after a few too many cocktails would be perfect. So onto the drink. I ordered ‘For Plums Sake!’ (£8.00) a clever play on words because the main ingredient was the very sour and mouth watering Plum Sake. Chris had a ‘Heard it on Grapevine’ (£8.00). The Plum cocktail was exactly what it billed; it tasted of plums. It was nicely balanced; the sourness and strong flavour of Plum Sake came through, and the sweetness from the Plum Jam was enough to keep you coming back for another sip (the whole thing did not last very long). The Russian Standard Vodka cleansed the palate a little, and although a nicer Vodka would have been welcomed it probably would not have made a huge difference. All in all I was pretty happy with it. Chris’s cocktail was altogether misconceived, or not made correctly. I ADORE G-Vine Gin. It is made with Grape Spirit, very unusual for a Gin. It is made in France and comes in a wonderfully satisfying fat bottle. I first tasted this Gin, neat, on a cruise ship and it was a revelation. I definitely prefer it neat, and Chris was curious as to how it could work in a cocktail. The mixture of other ingredients sounded like it was well chosen and thought out: Lillet Blanc and Aperol both strong flavours that when mixed do subdue their tones on the palate. Then mint, which I personally didn’t see the need for. It also had some lemon and grapefruit; nice sour flavours that counteract some of the sweetness of the G Vine. Well… I don’t say this lightly, but it was a car crash on the palate. My suspicions had been founded… There was just too much going on. The star G Vine was lost: The drink as a whole was unbearably sour that I felt the shape of my face changing. The bitter flavours from Aperol, Grapefruit AND Lemon, were not balanced. 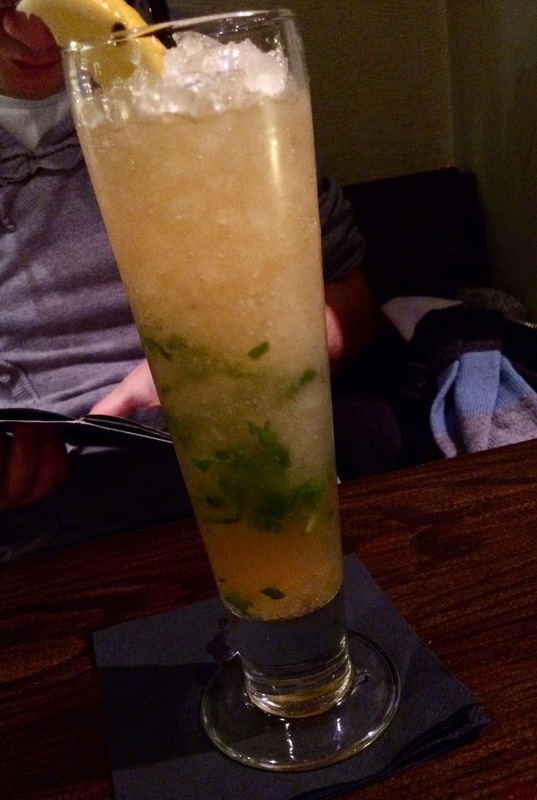 The mint was ridiculously overpowering on top of that, and why on earth would you serve such a drink, in a long glass because it actually tasted like a sour Mojito? So many wonderful flavours combined, that were clearly meant to be savoured, were now being watered down by a ton of ice in a tall glass; it felt less classy, and more like a Saturday night out with the lads in ‘All Bar One’. I ordered a second cocktail, to give Mokoko a fair chance because all in all the evening had been equally up and down, and my confidence in St Albans drink scene was flittering away. 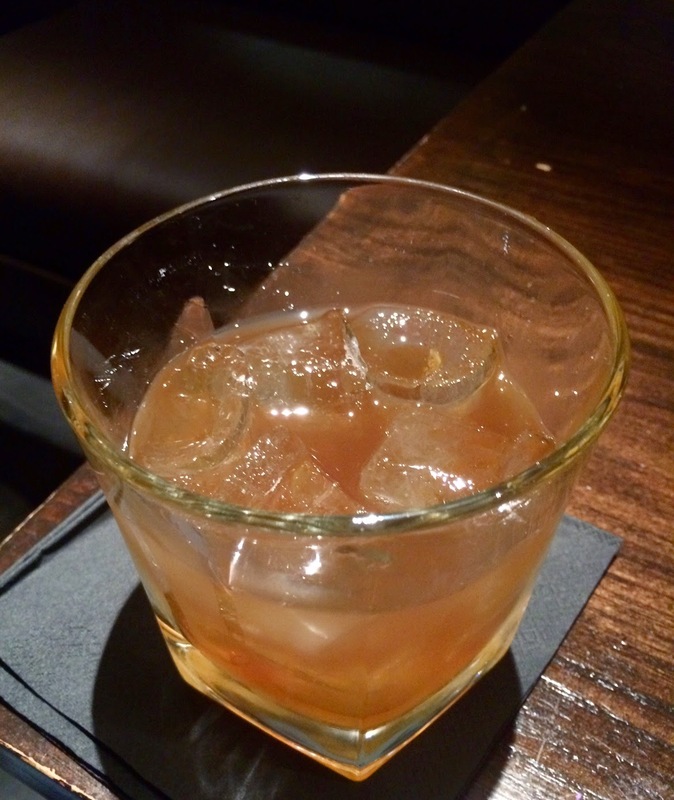 I ordered the Honey Nut Ol’ Fashioned (£8.00). It was a recommended drink on the menu and therefore was a true test. It did not bill any fancy ingredients, just mentioned it tasted like Honey Nut. Well, I am pleased to say that it did - after a while. The flavours left on the palate when you finished was a nice whisky base, dissolving into the well known breakfast cereal. It was clever and I quite liked it. I hated the glass it was served in though and had too much ice: If you read any good cocktail manual the glass is just as much a part of the experience as the drink. It has to be right, and in London there are at least 15 bars I could name that do get it right, consistently. The glass in this case was overly scratched and felt cheap and too big for the drink, but nevertheless as I said, it was tasty. The only cause for concern was that on first tasting all I got was a whack of Mozart Chocolate Liquor coming through which had also been clumsily spilled down the side of the glass, which is where the sticky sweetness must have come from (I might have preferred a honey based liquor). Even Chris tasted it and although he does not like sweat things, he does love an Ol’ Fashioned and could have enjoyed it. So.. To summarise there was a mixed bag here. Some great and inventive ideas, mixed with items that were trying too hard. I might be wrong, and the staff might have followed the cocktail recipes to the letter, but that is only half of it; not a single cocktail waiter tasted their creation before serving it. I have been to remote Spanish villages where they taste a cocktail before serving it, just like a chef should taste for seasoning. There are things that need to change here, but it is the only place of this sort in St Albans, and with such a nice mix of events in the week it would be a shame not to try it out a few times. In my opinion you should get yourself along to Tomoka Spirits, for this shop is the real star! CHI Chinese Cuisine - Authentic or Generic? There are thousands of Chinese restaurants in the UK (over 600 in London alone), and although some may have unusual items on the menu, or little variants of the classics, there are VERY few places that are genuine and original in both their feel for the cuisine, and their assumptions on what the public will like. 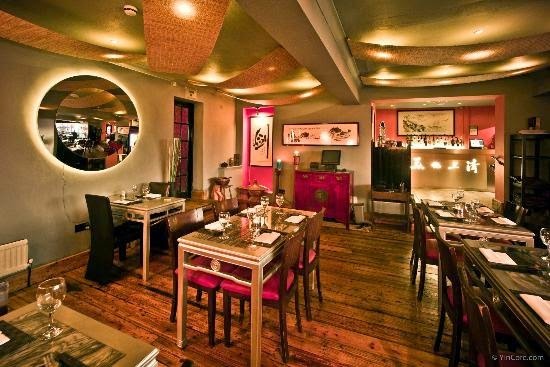 The best Chinese restaurant, by a country mile, that I have been to in London in called Hunan; a special place in Sloane Square that takes weeks to get a booking at. It is very sparse though with no extra glitz or show; basic white tables and walls are what greet you. In Hunan you get what the chef dishes up, which is different every day, and you have little to no say in this matter. I love this concept and it is not the first time I have experienced it; when done well it offers a real show of theatre and flair. The many little courses at Hunan offered bites of non greasy, umami filled and tonsil tickling flavours. Nearly everything came wrapped in lettuce leaves so you had no idea of the flavours until you tucked in. Well... When wanting to try something new on a very cold evening last Wednesday night I booked in at CHI Chinese Cuisine on Holywell Hill. First impressions were OK, although it looked like it needed a little sprucing up. The place was a little cold, and there was a weird smell of damp coming from somewhere (probably just the incredibly old and historic building it inhabits). The waiter was truly lovely though and very welcoming. It was rather empty when we arrived; this filled me with a little sense of dread considering that this very food orientated city was out in force that evening in places like Cote and the less than adequate Bill's. One look at the menu at CHI, and I was sold. Tea smoked chicken and lettuce wraps on the menu immediately set off bright bells of joy. It appeared that this place was refreshingly different in the concept (take one look at the menu and you will see what I mean), and had enough truly traditional items on the menu to satisfy my love for the genuine article. Another good sign was that the menu was not too big. It did not read like the Magna Carta like nearly all Chinese menus. On to the food: Well my partner for the evening, Chris and I ordered the irresistible Oolong Tea Smoked Chicken (£5.50) and 'Chiu Yim' Squid (£5.00) - BOTH of which were so so yummy. The gunpowder smokiness was very obvious through the Chicken itself, almost to the point of being overdone, but it never was. It was accompanied by some very lovely vegetables, well cut and dressed in such a tasty slight chilli sauce. Chris's dish was equally wonderful. The batter around the Squid had a wonderful wholesome taste and was very well cooked; very toothsome to the bite and seasoned to perfection. As much as I wanted a 'Second Course' before the main event, I just could not manage one that evening. The next table along ordered some lettuce wraps from this part of the menu and they looked fabulous. We both opted for the Kung Po Sauce, myself with the Angus Beef (£8.50) and Chris with the Hand Made Tofu (£7.00). Chris had the Steamed Jasmine Rice (£3.00) and I had the Chicken Noodles (£6.00) as a side (being a bit of a meat freak that I am). 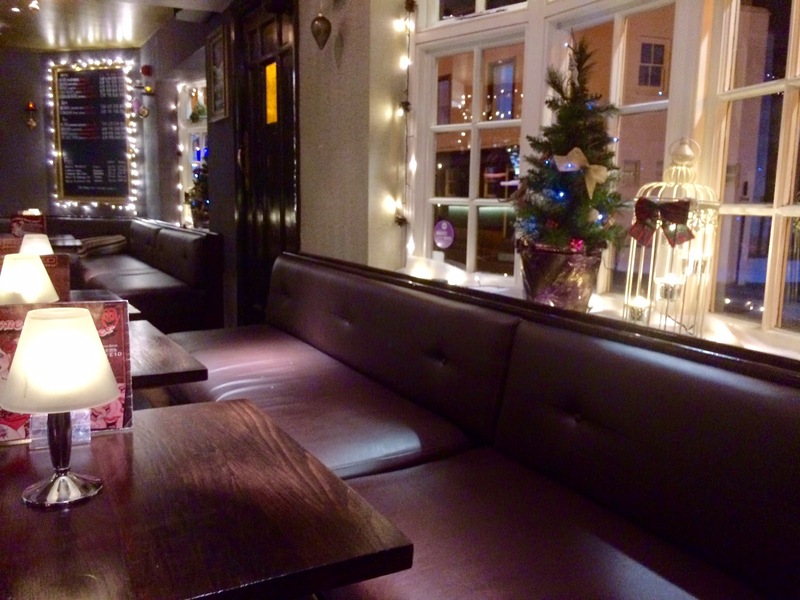 Both dishes and the sides were like a warm hug by Santa himself, in a big wooly jumper. The sauce itself was not too rich, but was still sweet and sticky with a nice hint of chilli, and a slight bite of sourness. All the flavours refreshingly came through, unlike so much of the Monosodium Glutamate filled Kung Po chicken from so many thousands of local restaurants around the UK. The Homemade Tofu was just wonderful; slightly chewy and actually tasted of something, having been well seasoned. My Beef?... Well what can I say other than it WAS melt in the mouth. I have never had a more tender piece of meat, especially remarkable seeing as it was pan fried which usually makes the meat very rubbery unless it is the freshest grade possible. Chris's Jasmine Rice was wonderfully perfumed and relaxed the taste buds in between each bite of the sweet tofu dish. My noodles were beautiful and well cooked, if a little 'al dente' for my liking. They were very hot and not greasy at all. I ate the whole lot without feeling remotely bad about myself: In hindsight, although I was not that hungry, the portions were such that I probably could have managed that elusive second course. Price wise CHI's are not expensive at all and in fact are the same price as most OK-ish Chinese takeaways. The drinks had a nice mix, including some cocktails which I will be back to sample, although I don't think anything goes better with Chinese food than a cold Tsing Tao. The service was very decent and the staff friendly: the restaurant was only about half full though so I wonder how they would cope with a full house? In my opinion probably one of the nicest and most tasty Chinese experiences I have had of this nature (the culinary heights of restaurants like Hunan are rare). It was especially wonderful considering I did not order any generic (well... apart from the chicken noodles, but even they tasted lovely) dishes. So here I am, first review in and I will try and be as honest according to my own experiences as possible. YES. It is true (I found out looking at their menu), 'BUT WAIT' I tell myself. I bet it is just like any other cake shop/cafe; opens early and closes even earlier, not catering for the masses of people (at least the ones I know) like me, who, after a nice home cooked dinner want something more; who want the pleasure of going out, to try something a little different, and in my case, to walk off their main meal (well just a touch at least). Well think again! The Pudding Stop is open from 9am to around 10pm, sometimes later, but only earlier on Sundays where it is open until a respectable 9:30pm. At last I think to myself, I have moved somewhere where I don't have to pre think pudding. Don't have to regret not buying one in the supermarket earlier that day, in some vain attempt to convince myself that I am actually going to try and loose weight that evening. So, all this said; is it any good? Well in a word; Yes. I liked it. It was around noon, and I wasn't hungry for lunch (good job, because the only savoury thing they serve is a rather tasty looking cheeseboard, which I will try at some point). The simple but trendy decor is very London, which I like. It reminded me of the young fashionable places littering Soho at the moment like Gail's Bakery and Pizza Pilgrims. All the cakes are homemade, and their Chocolate Brownie seemed very popular with 3 people coming in to ask for them in the 40 minutes I sat there (I shall try that next time I think). The lighting was nice and muted, and the menu, although fairly small was exactly what any candy lover would adore. Good old fashioned puddings, some with a twist and others as they should be. I was so enamoured with the look of the place that I even bought one of their 18 month aged Christmas Puddings which look fabulous in their rustic wrapping. Not cheap; £17 or thereabouts for the smaller pudding, but I just know it will be worth it judging by the ingredients which include Stout, Sherry, Whisky (you know, all the important stuff). 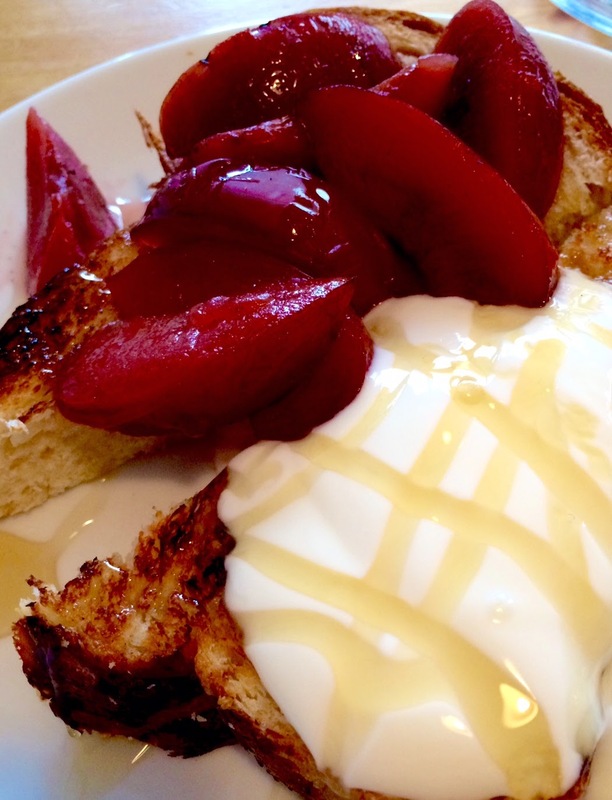 I chose from the daytime only options; toasted brioche with poached plums, yoghurt and honey (£3.75). I wanted something simple that would show to me the quality of the ingredients used and give me a hint into the care they have over presenting it. I also ordered a Cafetiere single origin coffee (£2.60). The food was everything I wanted; thick fresh yoghurt, soft and gently toasted brioche that had no element of rubberiness or staleness as I have experienced in other similar simple puds. The plums were very nice, not too sweet with a hint of Christmas cheer in their aroma, and a perfectly nice honey, drizzled generously. I loved the way it was presented, with the contrast of colours and oozing nature of everything. The coffee was a different matter though. 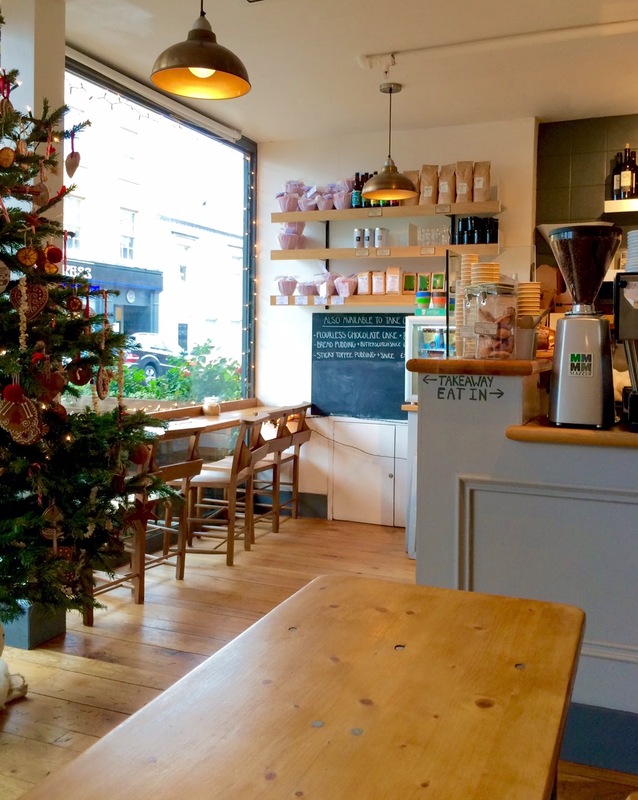 I LOVE my coffee, and will in time review Hatch which serves up the best made coffee I have had so far in St Albans. When you serve artisan coffee beans to the public, they do tend to, in my experience expect an artisan coffee experience with that little extra care to get it perfect. 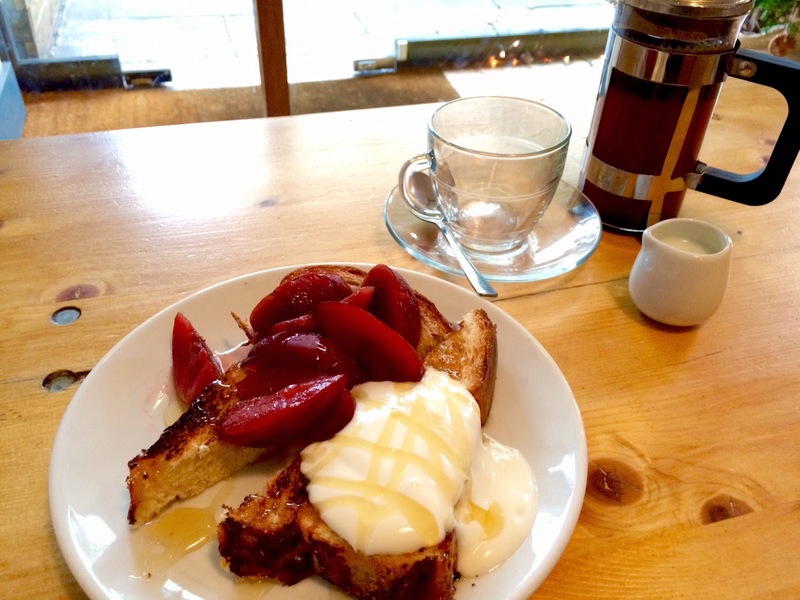 The Pudding Stop uses Climpson and Sons coffee beans, an artisan company that supplies top quality single origin beans to shops around the UK. I have not personally heard of them before, but have it on good authority that their beans are very noteworthy. I ordered a cafetiere because it is one of the best and most honest ways to taste coffee. I recently bought a fancy coffee grinder for my partner Chris. I am not as knowledgable about coffee as Chris, or as much of a huge tech fan/snob when it comes to making the perfect examples. However, I do know when what I taste is right and for me, the coffee was just not ideal in this case, although it was nicer than your average coffee shop blend for sure. The length of time the coffee should be left in the cafetiere before plunging was not mentioned on the menu or by the really lovely waitress, but incidentally I knew that for a 2 cup cafetiere you should leave it for about 3-4 minutes depending on the strength you like. I felt that the grind size was perhaps too course because I was not getting the true notes of the coffee and it all seemed a little bit watery and insipid. This could have also meant the temperature might not have been correct, beans were old or not enough coffee was used for this blend. It is such a hard subject to get perfect and the number of coffee brewing competitions around the world shows us this quite clearly. It is nice they served the coffee with milk but I feel that whenever you serve milk with coffee, it should be steamed and warm. When you steam milk to a certain temperature you bring out the warming sweeter notes, which compliment the coffee beautifully. Serving cold milk really does detract from the experience. All this said on the subject of their coffee (which no restaurant I review will be immune to considering the boom in coffee culture in England), it was really rather lovely. I look forward greatly to trying their Christmas Pudding and might even have a few words to say about that after Christmas. I will be back to try their amazing sounding milkshakes, brownies, bread pudding and cheese board. The price is less than what you would expect to pay for a nice pudding in a nice restaurant, so from that point of view it is competitive enough to attract the masses. YUM! Why St Albans? Is it really that up and coming? So... Here I am, aged 30 and after 5 years thinking about starting a food blog, only to be daunted by the ridiculous and ever expanding waist line of the culinary writers world, actually doing it for real. The real reason in fact, that I am starting this now and not 5 years ago when I realised how much I adored food, is life is now peaking into the next chapter, offering a fresh start; I am there, ready for a new experience, mouth wide open as it serves up an Amuse-bouche that I am rather excited about. I have recently moved to St Albans, just off London Road in fact, on the 17th November 2014. Me and my partner of 11 years, Christopher were debating a number of places to move to after living in and around Welwyn Garden City for 10 years. After months of deliberating and not wanting to move too far from WGC we chose St Albans. What, I must shout to the heavens, an AMAZING decision we made. Christopher and I are both huge food and drink lovers and, along with my best friend Ashley (who once wrote a food blog on the London food scene), used to eat out and sample some of London's stellar restaurants. We delighted in talking for hours about them. It actually became exhausting and eye poppingly expensive, to the point where the novelty wore off and we lost the passion for exploration; but we never fell out of love with food, just with the fact we could never keep up. Since being in St Albans, and even a few weeks before the move, to our surprise we have delighted in nearly every place we have tried, never imagining what the current food scene would be offering up on the tastiest of platters. When doing my research on numerous restaurants in the area (as I increasingly became more excitable) there was very little written about them. This is where I feel I come in, and am genuinely excited about being a part of helping others to choose their night out hot spots. In the last month I have tried hidden gems, been greeted by wonderful staff and had a whole host of experiences. All that said, there have been some 'not so great' places, and some places that simply don't have the current 'in trend' vibe that a younger or more discerning crowd would like. I have no idea where this journey will take me, or if the current increase in exciting and trendy eateries in the area will be sustained, but I CAN start at the beginning according to my own experiences. Happy reading and Bon Appetite!